Shallow wetlands near sandy uplands. This is a long-lived, medium-sized turtle. Adult males are of 6¾″ to 10¾″ in length. Females are a little smaller. 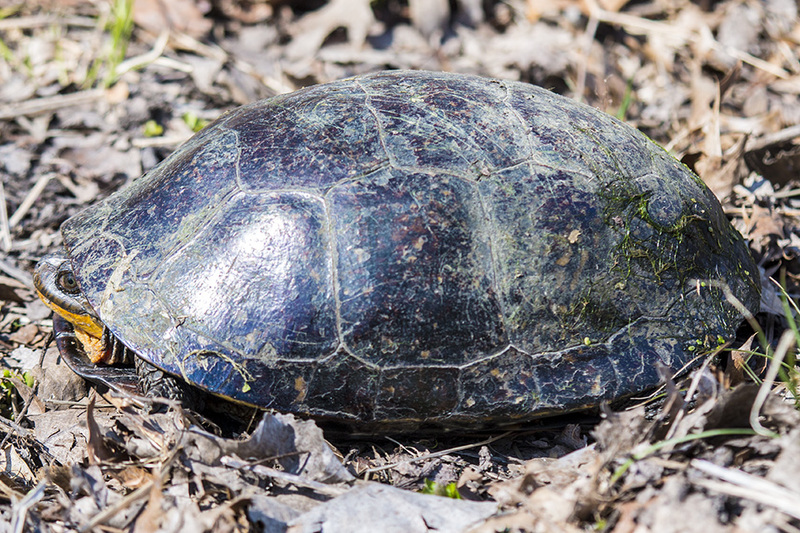 The hard upper shell (carapace) is elongated, smooth, and high domed. It is black with scattered yellow flecks or dots. It does not have a longitudinal raised ridge. In some individuals the carapace appears almost entirely black. The scales (scutes) that form the carapace are flat, not sculpted. The lower shell (plastron) is hinged between the forward (pectoral) and rear (abdominal) scutes, allowing it to completely close its shell. There is a V-shaped notch near the tail. Each scute has a large dark blotch on the outer edge, at least at the rear corner. 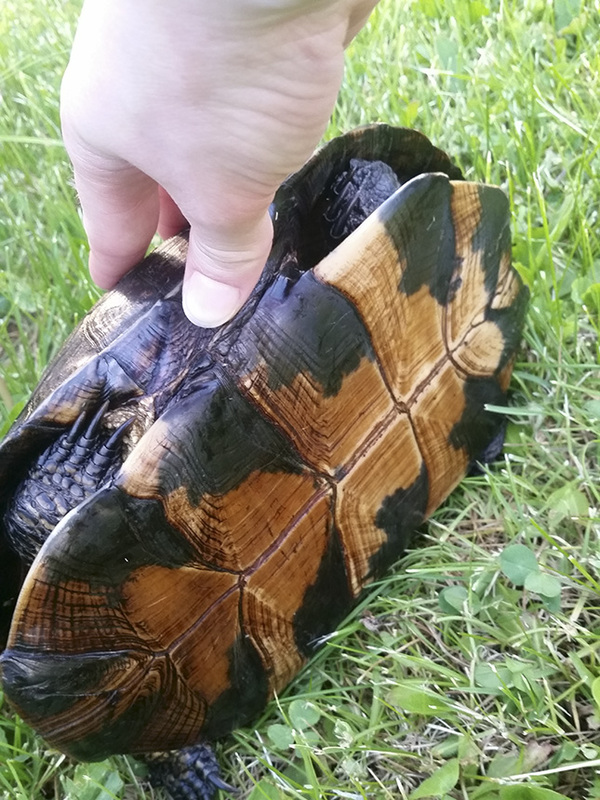 On males the plastron is slightly concave. On females it is more flat. The head, neck, legs, and tail are black or dark brown and are sometimes speckled with yellow. The chin, throat, and underside of the neck are bright yellow. The head is elongated and small. The snout is short and rounded. The upper jaw is notched, giving the appearance of a permanent smile. On females the upper jaw has some yellowish, vertical striping. On males, the upper jaw is black and unmarked. The neck is short. The neck and head together are less than half as long as the plastron. The legs are modified for swimming but are not flipper-like. The toes are webbed. The tail is short, less than half as long as the carapace. The female has a narrower tail than the male. Crayfish, insects, leeches, snails, small fish, frogs, berries, and other plant material. 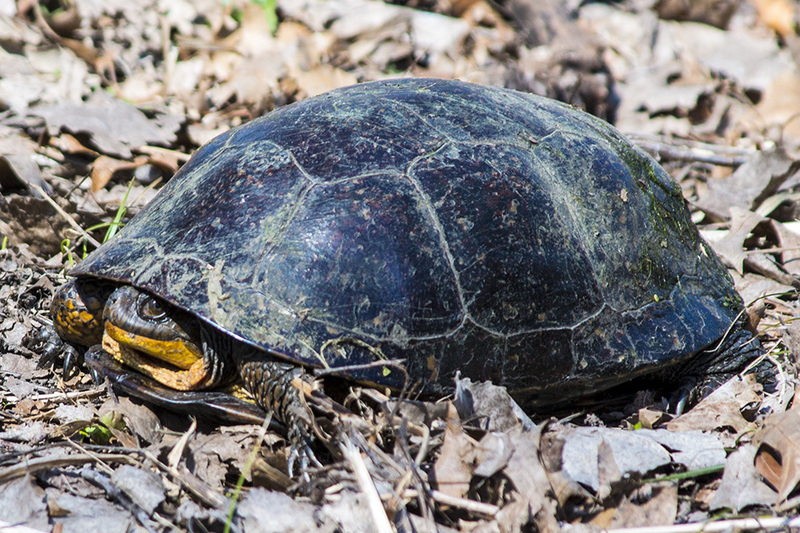 Blanding’s turtles emerge from hibernation in April and bask in the sun away from the shore. Mating takes place throughout the warm season but mostly in April and May. In late May to early June, after mating, the female finds an open sandy area to nest. She digs a hole about 6¾″ deep and deposits her clutch of eggs. The clutch size about 10 eggs on average but may be from 6 to 21. The eggs are elliptical and about 1½″ long. 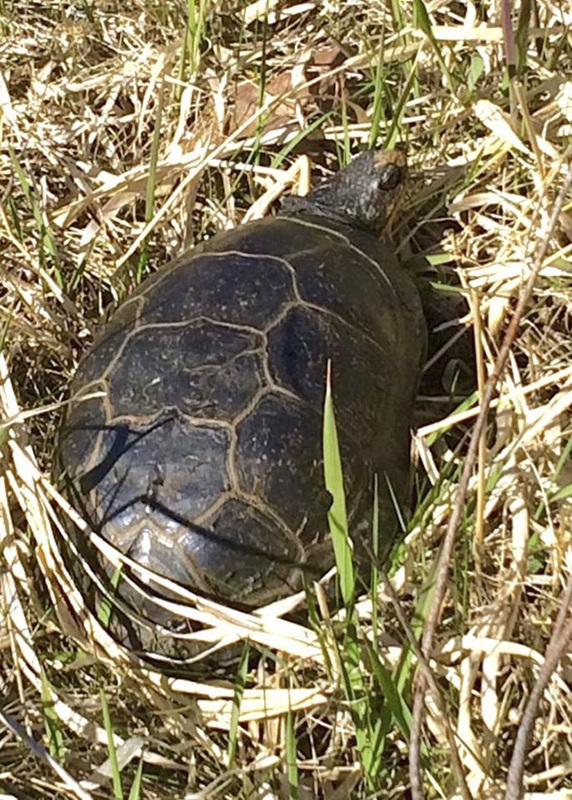 Hatchlings emerge from early August to mid-October. In mid-October Blanding’s turtles begin hibernating in muddy bottoms of deep marshes. Hatchling mortality is high. Adults can survive 75 or more years. Females reach sexual maturity in 12 or more years. 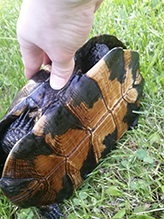 The hinged plastron allows the turtle to close the front of its shell. 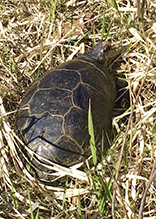 The concave plastron on males facilitates mating. It is the first turtle to submerge when disturbed and the last to emerge after being disturbed. Sources: 7, 11, 14, 24, 29, 72. Two classification schemes for the four turtles formerly included in the genus Clemmys have been proposed. 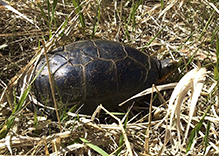 In one scheme Blanding’s turtle and three other species are included in the genus Emys. 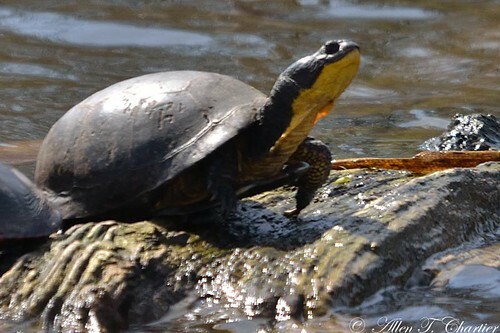 In the other scheme Blanding’s turtle is the only species in the genus Emydoidea. Both names, Emydoidea blandingii and Emys blandingii, are currently (2014) in use in published sources both in print and online. The hard, lower (ventral), shell-like covering (exoskeleton) of the body of turtles and tortoises. A hard, external scale that forms part of the exoskeleton; as on the belly of a snake, the upper and lower shells of hard-shelled turtles, and the foot of a bird. Found near my home. Left alone in same spot/direction. I think it may have been a male. Found in road near my home. Re-located it in direction it was going. 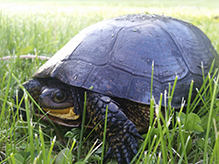 Educational video of the Blanding's Turtle (Emydoidea blandingii) and its conservation in Ontario, Canada. Additional stock footage donated by Paul Whippey (fox pups) and Joe Vass (crayfish). 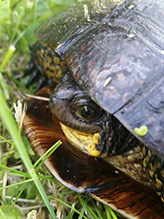 Chris Leone of Garden State Tortoise presents: "BLANDING'S TURTLE"
A music video montage featuring a look at the life of one of North America's most fascinating species of fresh water turtle. To coincide with the release of REPTILES MAGAZINE'S October 2012 issue which displays a thorough article written by Chris about the Blanding's turtle, this video is a bonus for viewers already familiar with the species as well as an excellent briefing to those just finding out about them. Please spread the word and pass this video along to help educate the public on these beautiful but endangered turtles. 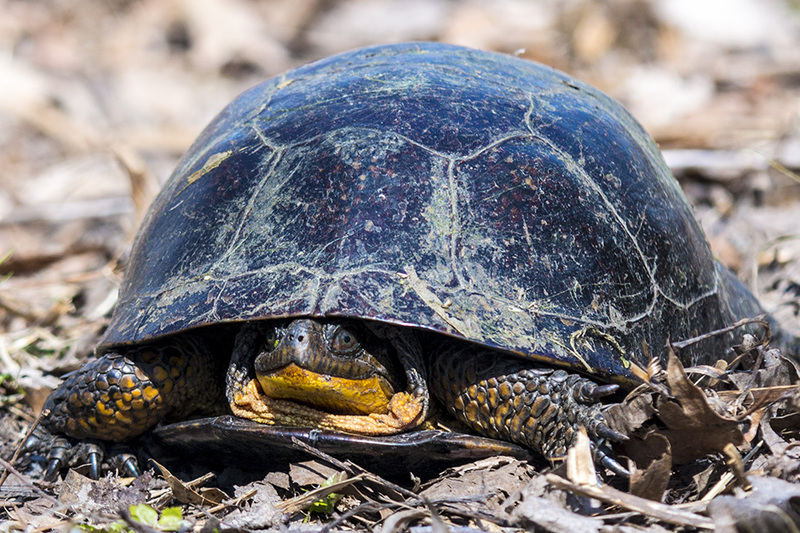 Staff Scientist Bruce Doran talks about one of Ontario's native species-at-risk, the Blanding's turtle, with a little help from some of the animal ambassadors at Science North. Crossing 222nd Ln NE, between Bataan St and Yancy St. This was in a residential area. 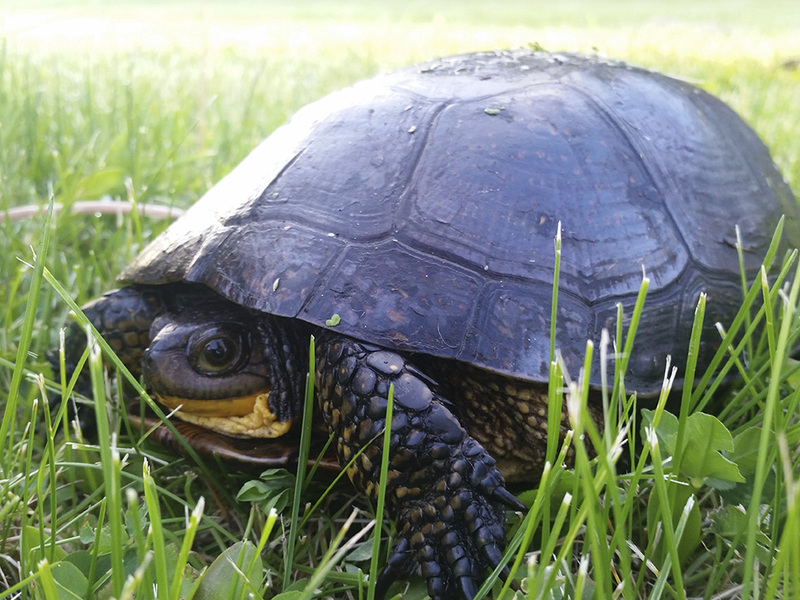 Turtle's shell was domed shaped, dark colored, approx 9" long, with bright yellow chin/neck. Had to pick it up and move it off the street. Location: Oak Grove – Cedar Creek Dr NW, 3520, outside of Cedar Creek Conservation Area, heading across road from 3520 to Conservation Area. That was a rainy day, and I was coming home early from work and spotted a lump in the road just past our driveway. 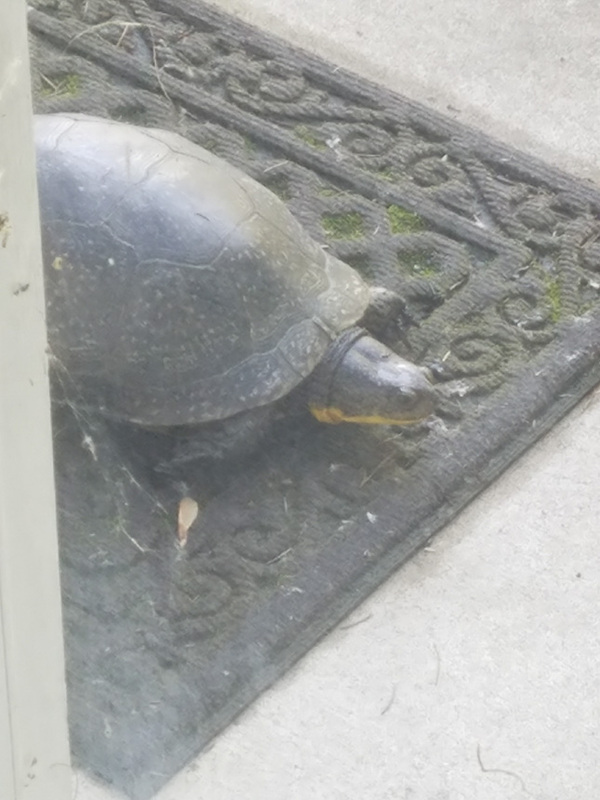 I got out of my car and walked up to it realizing it was a turtle, and not the usual snapper or painted we get frequently. 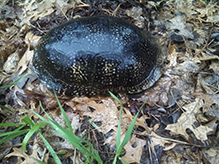 I took photos of it, not sure, but thinking it looked a lot like a blandings turtle. I picked her up and took her in the direction she was headed, safely across and away from the road. When I went out to check her out about 15 minutes later she was gone. Our land, from where she apparently was coming from, is mostly marsh, with some upland and lowland wooded areas and small area of lawn surrounding the house. We have a few open areas, a wet meadow, and swale in the woods near the road. 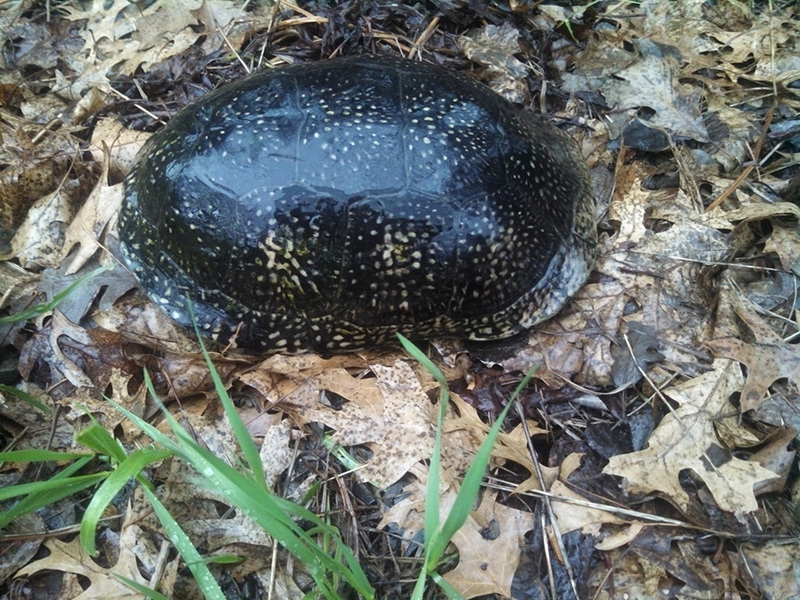 She, I am assuming she, as turtles in the spring head out to lay eggs, was about 6 inches long, maybe. Not large, but not small. She was very definitely a blandings, with the yellow on her shell. I took the photos and compared them to online images and it was a match. Cedar Creek Conservation area is a large area newly designated as a conservation area. It is comprised of Cedar Creek, adjacent flood plain and marshes and lowlands, other marshy areas, at least one fen, some upland savannah, old fields and some remnant prairie and savannah areas, and an old farmstead plot and fields near the Rum River, which the park also tracks along for a while.